The other day I was given a unique opportunity to “pay it forward” within the Detroit community by providing music and education to area children. The Detroit Institute for Children provides a passionate, integrated approach to services for Michigan’s children with special needs and their families. Through LinkedIn I met Emily Karlichek, Manager of Development and Partnerships for the organization. She asked if I would be interested to perform Armenian music for the children as part of their summer learning program. 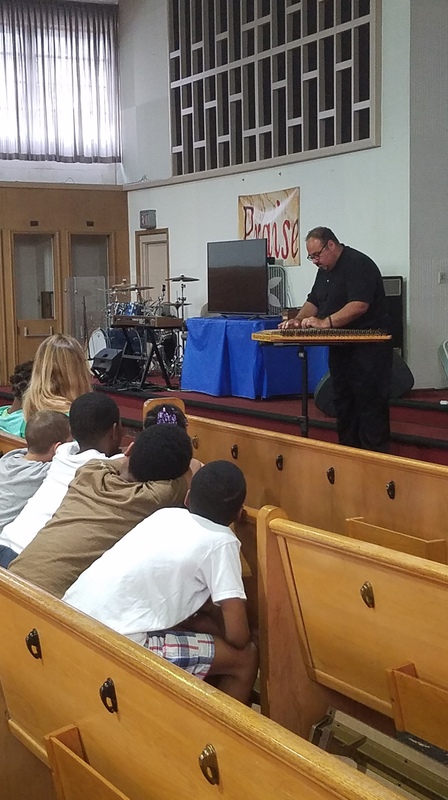 As I throughly enjoy playing music for kids, I was happy to accept the offer, not fully understanding exactly what I would be faced with and how I would pattern my “presentation” for these children. I arrived at Dove Academy, located in Detroit and brought into the church where I would be playing music. The maintenance man that let me in told me the church was built in the early 1950s. What a remarkable building. I felt it quite symbolic that I would be allowed to perform music inside a church for children with special needs. (As a side musical note, playing the kanun in any type of church is spiritual because of the natural warm sound one gets from playing this acoustic instrument in an acoustically pleasing building). Once set up, I just needed to wait for the kids to come in. I thought it would be nice for the kids to hear my music (in the hallway) before they entered the church with a curiosity that could be an attention grabber. As I began to play, the children filed in, about twenty of them. You could see both the amazement and bewilderment in their faces as they wondered what in the world was this instrument and what was I playing for them. As they got situated in the pews, I immediately jumped into the presentation knowing that attention spans will vary and I needed to engage with them without haste otherwise I might lose them for the rest of the time I was there. “Who knows what the name of this instrument is? !” I asked. An obviously funny question as none of these children had ever seen or heard of a kanun. The answers were surprising and better than I imagined. “A piano!” one yelled out. “A triangle!” said another. After explaining what the name of my instrument was I continued my query by asking them to guess how many strings were on this instrument. I led them down different rabbit holes to have some fun with them and they still stayed engaged. I began to play some music for them and even had them clap a simple rhythm in order to have them follow the music and identify a sense of pace within the songs I performed. I was only there for 30 minutes, but it was such a gratifying experience for me, I haven’t felt that way in a long time. The best part was at the end. I asked if they wanted to touch the instrument. They all jumped at the chance. 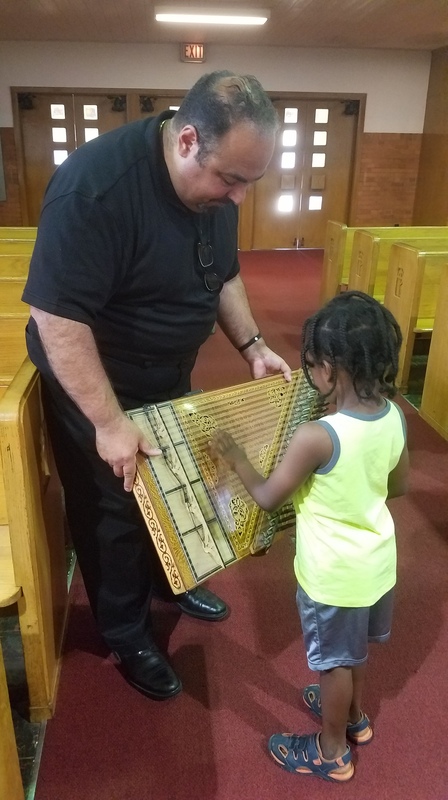 So as each one filed out of the church, they had the opportunity to touch and feel the kanun. 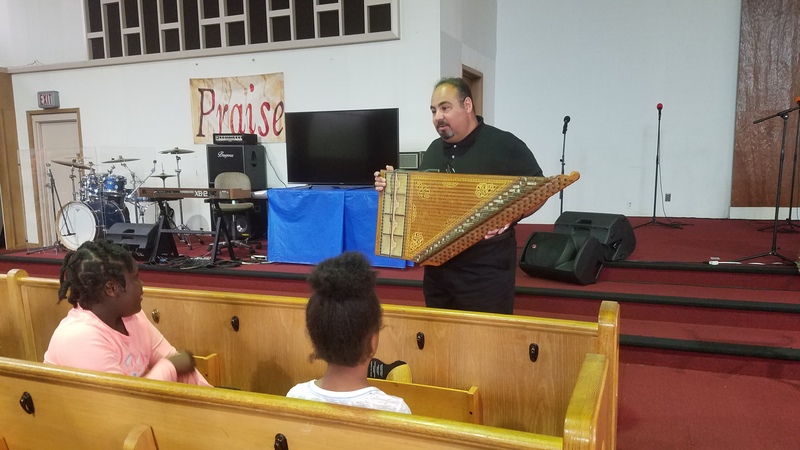 Music should never be scary or off-limits for children and especially when they have experienced such a unique instrument like the kanun, they should be allowed to touch it. 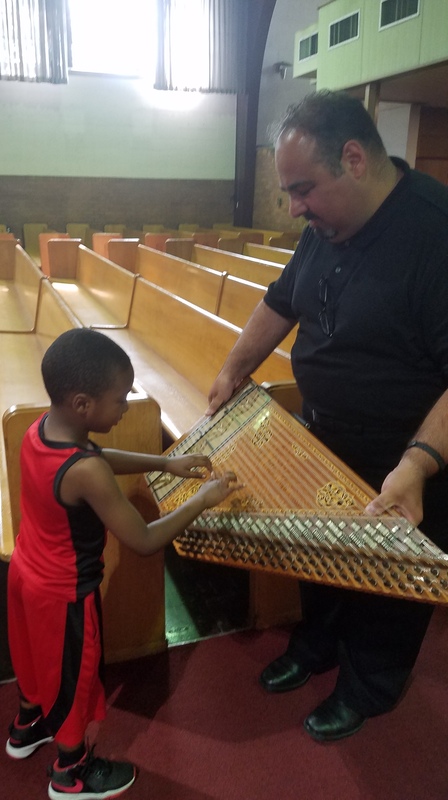 Oh sure, its an expensive instrument and I always have a bit of a sweat going that some kid may punch or grab a string too hard – but these children were gentle and very respectful of the kanun. As a matter of fact, I had to encourage a few of the children to run their hand up and down the strings so they could hear its harp-like sounds and feel the tone it made. It was worth every mind standing there for them. Then they were gone. I couldn’t help but wonder if they would remember this moment later that day or as they grew up. Realizing the challenges they face, what impact did I have on them this day? Whether or not they will retain my visit, I will retain the visit I had with them. I thank each of them for the opportunity to play music for them in order to give them something different in their lives. Please check out Detroit Institute for Children and if you are a Detroit artist reading this, consider giving back to the community and reaching out to this organization to volunteer some of your time. Currently, they serve over 5,000 children with special needs in schools, Head Start, and Early Intervention programs throughout Detroit and Southeast Michigan. Their services provide speech language pathology, occupational and physical therapies, social work, psychological services and special education consulting. If you are not an artist, please consider donating some money to their organization. Every penny helps. Click here to donate online. This entry was posted in detroit, music, Uncategorized and tagged Armenian, children, church, detroit, kanun, music, special needs. Bookmark the permalink.